Following the line of a very old Native American Trail, the Huntington Wagon Road was marked by J.W. 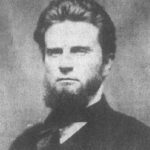 Petit Huntington in 1864 as a route between The Dalles and Fort Klamath. When the road was firmly established, it was used by prospectors, homesteaders, soldiers, and tradesman. Warm Springs Indian scouts frequently used the road in skirmishes with the Paiutes between 1865 and 1867. Heavy wagon-use along the road created deep ruts that are still visible today. Much of the original road later became OR Hwy 97—the main north to south arterial route through Central Oregon. In the 1970s a historic campsite was discovered close to a preserved section of the Huntington Wagon Road. Excavations at the camp revealed a variety of 19th century artifacts from soldiers and other travelers, including much earlier obsidian arrowheads from Native Americans who camped in the area prior to the blazed road. 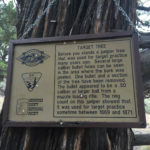 One of the marked trees in the Heritage Trail of Junipers is located very close to the campsite—the Target Tree. 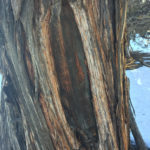 The tree is believed to have been used for target practice by soldiers in the 19th century and their large-caliber bullet holes remain clearly visible in the tree today. Three other blazed Junipers located along the road are included in the Heritage grove. They are known as Blazed Tree Number One, Number Two, and Number Three. Their heights range from approximately 25-feet to 32-feet and boast girths measuring from just under seven feet to nearly 11 feet. Today, these craggy notched trees are accessed by traversing a two-mile out-and-back hike. The Huntington Wagon Road Trail and Juniper Heritage Trees are located five miles northeast of Bend.